As a yoga instructor for the past 6 years, I know first hand the various benefits yoga has to offer, both for the mind and body. That being said, it should be no surprise that yoga is also highly beneficial for the health of our skin. Not only does yoga reduce stress, one of the biggest causes of adult acne, but it also improves our digestion system and promotes circulation of the blood and lymph, which in turn, eliminates free radicals from the body by increasing oxygen. Below I have included my top 5 favorite poses that will help get your skin in tip-top shape! This pose helps to detoxify the skin because it's a twist, and twists by nature are meant to ring out toxins from the liver and the kidneys like a wet towel, thus removing toxins that could potentially pop up on our face in the form of inflammation, Eczema flare-ups, or acne. Start by sitting on your yoga mat with both legs together extended in front of you. Hug your right knee into your chest, then cross the right foot over the left thigh, toward the knee. The sole of your foot should be pressing into the mat. Bend your left knee, bringing your left foot towards your right hip. Begin to bring your right arm behind you, and reach your left arm up high while lengthening your spine. Beginning to twist, tucking the belly button towards the spine and hooking your left elbow to the outside of your right knee. BREATHE DEEPLY for at least 5 breaths. Repeat on other side. Camel is an intense heart and throat opener. It broadens the lungs allowing oxygen to move in and out of the body freely, which is essential for healthy skin. 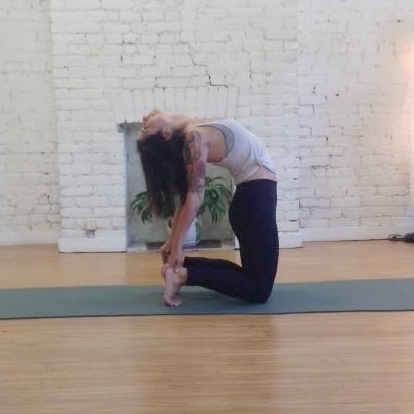 Tuck your toes under and bring your hands to your hips. Pressing your thumbs to your low back and squeezing your glutes, begin to lean back drawing the shoulders towards the spine. From here, you can begin to reach for the feet and let your head drop back gently. Stay here for 3-5 breaths. Follow camel with a few breaths in Hero pose. Being upside down in poses like Shoulderstand and Headstand is great for the circulatory system, digestive system as well as increased blood flow to the face, providing an improved complexion. It can also help decrease stress as well as balance hormones, two major reasons why we break out. Lay on your back with your legs straight in the air. Pressing the palms of your hands into the mat on either side of your hips, give yourself a little "hop" bringing the legs over your head behind you. Move hands to support the low back and drawing the elbows closer together. One leg at a time, reach feet towards the ceiling, pointing the toes. Tuck the belly in and the pelvis slightly forward. If this is your first time attempting headstand, do the following facing a wall. Come to all fours and bring elbows to the mat shoulder distance apart. To measure the distance between the shoulders, graze fingertips to alternate elbow, then interlace fingers creating a rounded shape with the hands. Place the crown of your head in your hands, tuck your toes, lifting your knees from the mat and walking your feet as close to your face as possible. From here, you can begin to lift your legs above your head and into a headstand. To maintain the balance, use the core and reach through your feet, lengthening your entire body upwards. Stay here for 5-10 breaths. Resting your feet on the wall until you build up the strength to do this pose will also provide the same benefits listed above under SHOULDERSTAND. This type of Pranayama breathing calms the mind by balancing the two sides of the brain, while simultaneously aiding in the function of both our respiratory and nervous system. 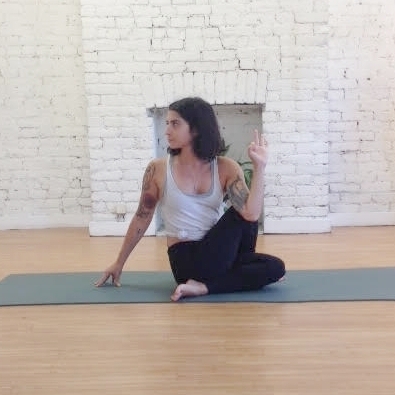 Find Sukasana, or easy seated pose. Bring your left hand on your knee (palm side up for energy, palm side down for grounding, or a Mudra, such as Jnana, which is the one I am doing in the photo at right). Create a "hang 10" symbol with your right hand by extending your thumb, ring and pinkie finger, with middle and index finger tucked in. 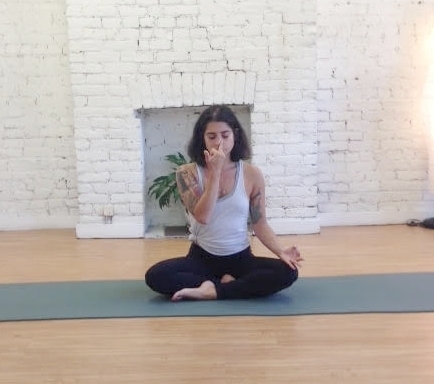 Take your fingers and cover your left nostril, exhale everything out your right nostril, then inhale. From here, cover your right nostril with your thumb, and release your left nostril and exhale. Repeat this pattern 10 times, alternating nostrils. When finished, release left hand to left knee and breathe evenly through both nostrils. This is a great place to begin meditation.